I eagerly waited for A Second Look Bookstore to reopen at its new location, and I finally ventured out to check it out. I LOVE used bookstores, and I could spend hours browsing through books. I'm always on the lookout for books to put on my classroom shelf, but I also found a few classics that I've been eager to read for a while: The Canterbury Tales by Chaucer, The Inferno by Dante (translated by John Ciardi), Grimm's Fairy Tales, and Their Eyes Were Watching God by Zora Neale Hurston (Read this last one in AP English in high school). ​I've decided to start with Dante's Inferno, primarily because I hear it referenced in many other books and movies. I struggle to put it down before I go to bed at night. I'm on Canto VII, Dante's descent into Circle Four and Five of hell, and I'm truly captivated by the remarkable description, unique imagery, and unbridled imagination of Dante. Surprisingly, as I descend into Dante's Inferno, I haven't had nightmares - yet. Lady Midnight - Well, I don't often do this, but I'm going to put this one down for a bit. My purpose for reading this book was to determine whether or not to add it to my classroom library this fall, and I do not feel it's appropriate for middle school for several reasons. While I recognize how it entices readers with it's hard-to-put-down cliff hangers and air of mystery, it lacks enough substance to merit inclusion in my classroom. 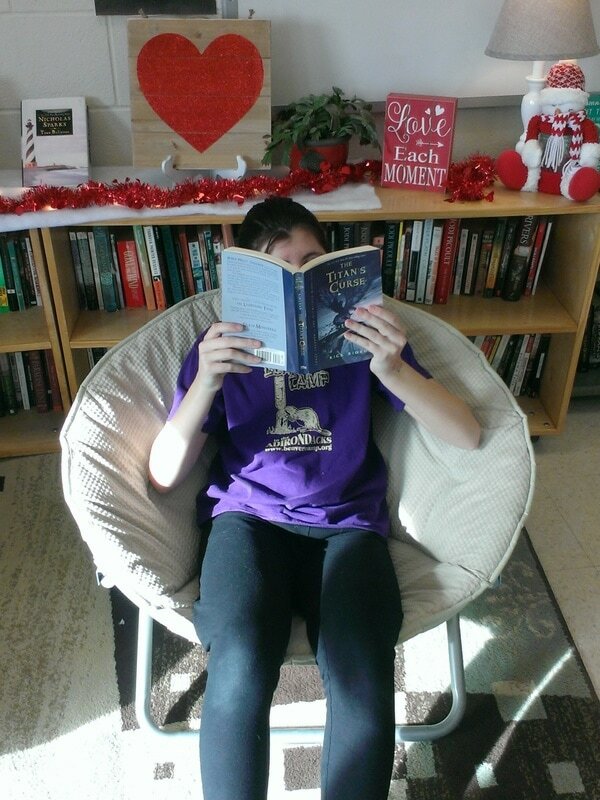 Emma, a member of the MS Book Club, reading one of her favs from The Percy Jackson Series!